Paradise and relaxation is just a short ferry ride away. This is one of the best properties we currently rent. Views like this don't get any better. Big West facing windows looking out over the blue water allow you to not only watch the ferries go by every half an hour, but also provide you with a sweeping view of the Olympic Mountains and the gorgeous sunsets that come with it. This place has a lovely sunken in living room with a large fireplace, perfect for keeping warm while staring out onto the water. With an open layout, the updated kitchen is stunning. The stainless steel appliances and marbled countertops will make you want to cook! There's also an island with stools for friends to sit at while you cook them up a storm. Once you go upstairs the views get even better. The master bedroom has an excellent vantage of the water and mountains in the distance. The guest room on the other end of the house also holds similar views. The two bedrooms are divided by a lounge room with a WiFii enabled smart television for the days that lounging about sounds better. Once you land in Vashon there are several dining options around. Lots of highly rated restaurants, bars, coffee shops and gift shops are all within a 5-10 minute drive on the island. You won't find yourself without the proper vacation tools here. Explore the island by taking a hike or going horseback riding. There are many parks that fill the island, enjoy the views from almost all of them! If you'd rather do more at the waterfront, take a shot at saltwater fishing. Here at All Around Seattle Vacation Rentals, we vow to make booking with us simple and exciting. We know that booking a rental property home for your vacation can be unfamiliar territory for some, while others know their way around it. Because we know this, we ensure that each of our properties are up to high quality standards. Beautiful views and very well maintained! The location cant get any better! Only 5 mins from the ferry. It was breathtaking to wake up to the water and the sunsets are something else all together! Gorgeous views! The house is cosy, but as many reviewers have mentioned before, its not someone house but a vacation property managed by a company. It has most of the very basic amenities. Our only issue were the beds. 1 King bed and 2 single beds were caved in and uncomfortable. There was a spare air mattress which also was not comfortable. Other than that our stay was great and the location amazing! This house was absolutely beautiful, the views never got old. Will definitely be looking to stay here in the future. The house was perfect for our visit to Vashon! We loved the location and views. We you happily rent it again. Thanks! 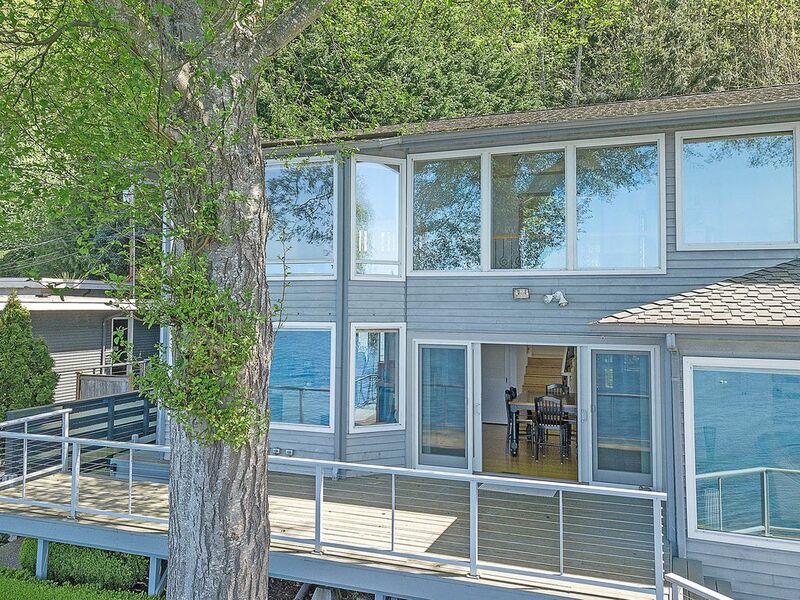 This is a lovely home, well maintained with a royal view of the Sound, and the picturesque ferry crossing. Lots of windows frame the view. It is quiet and peaceful here. What a great break from the pressures and stress of the city. Plenty of beaches for walking and exploring to fill up the day. There's 1 king bed In the master bedroom and 2 twin beds in the other bedroom, plus several large couches. There are also 3 bathrooms - very nice. In front of the house the beach is pretty rocky and is shared by a Great Blue heron, killdeer, sandpipers and a pair of ospreys. No whale sightings this trip. We absolutely loved our trip. The veiws were to die for. Waking up to the ocean out the bedroom windows, sitting out on the deck listening to the ocean, watching the kids comb the beach for sea shells, driving into town for a bite to eat at some great restaurants and shopping, riding the fairy to and from, it was just a beautiful vacation. It was low tide when we went so we played on the beach as much as possible. Helpful notes for future guests...A car is much needed to get to and from town and ferry. Penny was so great to work with and quick to respond. The house is very clean and had everything we needed to cook. We would stay here again for sure!!! Our family of 7 loved every minute. Thank you for sharing this home with us. We loved Vashon!